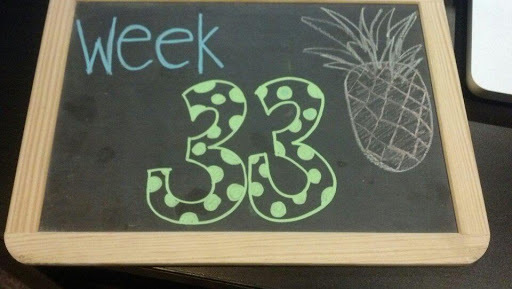 Week Thirty Three was extremely eventful, which means this blog will be jam packed with the details. Brace yourselves. A few weeks ago I had made a comment to Ben about “spicing” our house up and this was the week the spicing up began. A few weeks ago we had an estimate for painting the interior and this was the week that it would happen. Monday and Tuesday I spent the day cleaning out my closet (also known as Tornado Allie) and taking things off the walls. When we decided to do this I didn’t put two and two together at how much work this would be. Our house looked like we just moved in. There was stuff everywhere and we found things that we didn’t even know we had. The painters we estimated to be here for three days. I knew that staying out of their way would be the best thing so on Wednesday I had lunch with Amy B (she couldn’t make the shower so we met up to catch up) and Thursday I hung out at my parents. On Wednesday when I was at lunch, I dropped Bernie off at my parents so he would stay out of the way of the painters. It was the first time he’d been left with other people since Dakota died. We all know that I have a strange obsession with my dog, but I seriously was nervous about leaving him. Not that he wasn’t in good hands, but the little guy has been through a lot. Mom teased me because it took me at least 10 minutes to leave. In the end he did fine. Pretty sure he drove my mom NUTS. Lunch though was FABOULOUS. We went to Egg Harbor though that wasn’t our original plan. We were meeting at Simple, but when I was about to walk in there was a sign that said “closed due to sewage problems.” Amy and I both decided that we appreciated their honesty, but sewage problems at a restaurant is not appealing at all. Luckily Lake Geneva is full of many good food choices. It was great to catch up with Amy. Man do I miss that girl, but love that we try to get together once a month!! On Thursday, while the painters were finishing up (they worked fast), I head to my parents house to help with the favors for my shower. Mom wanted to make cake pops, but the process is a pain. She did some Google Search (I was so proud of her) and found a way to make them that wouldn’t last all day. We took sticks, dipped them in melted chocolate and vanilla flavor, stuck them in donut holes, dipped those in the chocolate or vanilla flavors and set them to dry. It was a tedious process, but not as awful as making cake pops. Not to mention they were delicious!! I then made tags which we attached with ribbon to the bag the pops were in. The painters were finished by the end of the day Thursday, but that didn’t mean I could get things back in order on Friday. We had to wait for things to dry, so all I could do was sit and look at the mess (super depressing). Saturday was my last shower. My mom, Katie and Ashely planned the whole thing (though I did give the guest list) and I couldn’t have asked for a nicer time. The shower was held at the Cotton Exchange (same place we had our wedding reception). There were about 42 people there and I was so happy to see everyone. Some people I haven’t seen since I was just barely pregnant. It was nice to catch up!! We had soup, salad, breadsticks and mini sandwiches for lunch…YUMMY!! Not to mention the cupcakes and cake pops for dessert. Since there were so many people and I didn’t know that I’d have time to talk to each person, I decided to go around and have pictures taken with them. That way I at least got to say “hi” to everyone. Check out the post after this one and you’ll see all the pics!! After the shower it was time to head home and figure out where the heck to put all this stuff. For now we are stuffing it into a room and I’ll get to it when I’ll get to it. Not to mention we found some unfinished spots from the painters so they have to come back to fix them. No use in setting things up just to move them again. Though with all this stuff I’m pretty sure we need another house!! He’s already taking up two bedrooms and he hasn’t even arrived yet. We are definitely beyond grateful for all that wonderful gifts we have received. He’s a lucky little man. Sunday I headed to church where we had the renewal of baptism. When I went up to the font the pastor put the water on my head to bless me and then blessed my belly. It was so sweet and made me feel all warm and cuddly inside. Kelly and Chais come over in the afternoon. It was great to catch up with them. I wish we lived closer together so we got to see each other more often. She did promise to come home after Henry arrives and that is definitely something to look forward too!! Sunday we also had plumbing issues. Ben was gone and I was giving the dog a bath. Well, the sink backed up all over poor Bernie. I had to throw him out of the sink. Baths were his least favorite thing before, pretty sure the sink backing up on him made his fear even worse. After I cleaned up the third round of water Ben came home to see what the problem was. I should say when I originally called the problem wasn’t that bad, but once it got bad I decided to call for help!! He spent a few hours figuring it out and I went to put my closet back together. Such a chore that closet is. I need to make a new year’s resolution to keep that thing clean and organized. Finally, the end week 33 I had my maternity pics with Megan. From the beginning I told her that I would love to do them outside as I LOVE winter. She was up for it and though we didn’t have a ton of snow we made work. Not to mention she is amazing with the camera so I have no doubts that they’ll turn out amazing. It’s hard to believe next time I see her it will be at our newborn shoot!! This is the third or fourth time that the baby has been the same size of the fruit that I’m craving that week. I didn’t even plan that!! Maternity Clothes: Getting dressed is a chore, but I manage to do it daily because I don’t want to get into a slob slump. Sleep: I still hate sleeping. Some days I sleep in our bed, some days I sleep on the couch. It just so happens that first trimester sleeps have returned and long naps are a must. The lack of sleep doesn’t seem so awful thanks to those. 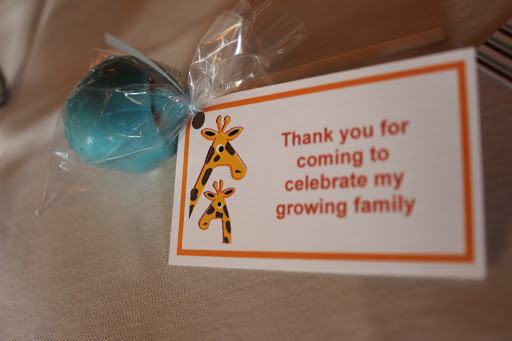 Best Moment of the Week: My baby shower. We are beyond blessed. Miss Anything: Bending over and getting up without help. Ben literally helps roll me over when I need help and props me up off the couch when necessary. What a guy! !